What is this code? | What Car? 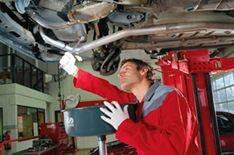 The new Motor Industry Code of Practice for Service and Repair is a collaboration between the Retail Motor Industry Federation (RMIF) and the Society of Motor Manufacturers and Traders (SMMT). Basically, its the first major attempt by the industry to regulate itself properly and deliver to a certain standard of work. All of the member garages have committed to treat motorists fairly, be open and transparent about pricing and to complete work as agreed and to the right price. Theyll also have competent, courteous staff and have a system in place to deal with complaints. At launch the code has 4000 members signed up, with the hope of doubling that figure to 8000 over the next 12 months. Currently just 10% of garages on the scheme are from the independent sector. It's understandable that franchised garages were targeted by the SMMT and RMIF first - its the easiest way to get a large number on board - but independents need to be encouraged to join. There are a huge number of independents so consumer watchdog the National Consumer Council says it would like to have 50% of garages on the scheme from this sector. Youll find a full list of these workshops at www.motorindustrycodes.co.uk. Should a disagreement arise between you and a garage, a free advice line will be available on 0800 692 0825, while free conciliation will also be on hand. If this doesnt resolve things, an arbitration process can be used. The long and the short of it is, if you use a member garage and youre not happy with the results, you should be able to get things resolved quickly.